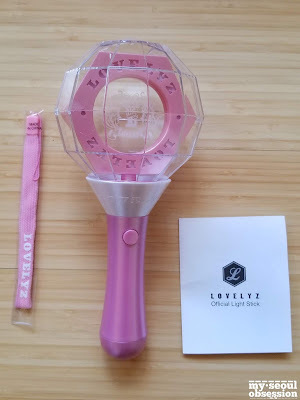 Shortly after the announcement of Lovelyz coming to the US, I knew I had to get an official Lovelyz lightstick! I found one available on eBay from seller grapemusiccd on March 8th, however it was sold just a minute before I confirmed my order. 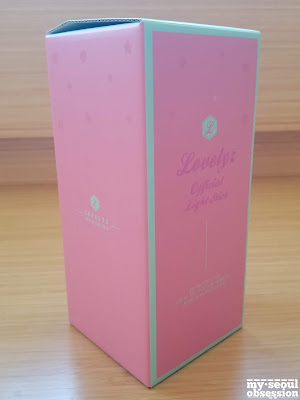 The same seller then put up two more Lovelyz lightsticks for sale the following day, and I made my purchase on the 9th. Woollim last sold Lovelyz lightsticks at the Lovelyz in Winterland 3 concert series in Seoul from February 14th to 17th for 30,000₩. I purchased mine for $37.99 USD plus $11.99 shipping, but added a note to the seller that I would like faster, tracked shipping. The seller replied the following day that DHL would be an additional $23 and he sent me a PayPal invoice for that amount. I paid the additional fee and he shipped out my lightstick on the 10th. 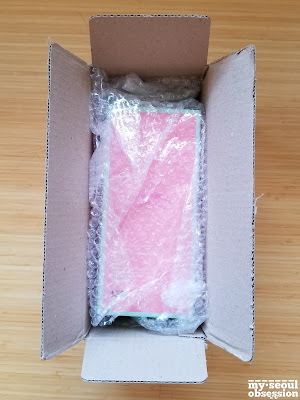 I received my package on the 12th! 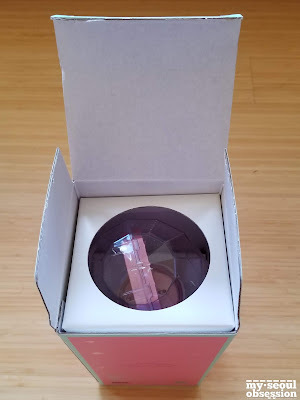 The lightstick box was loosely wrapped in one layer of bubblewrap and placed in a cardboard box just slightly bigger than the lightstick box. Here is the lightstick box! The box is mainly pink with a light mint green for the accents and top and bottom. 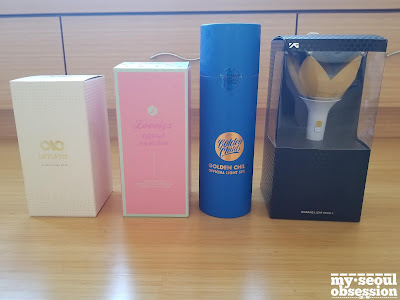 For reference, I'll occasionally have my other lightsticks in the blog too. Sadly the top flap of the box is a little bent, as if someone had previously opened the box. Furthermore the seal had been removed, with only the sticky residue outlining the seal left behind. Perhaps it was opened to ensure the product was in perfect condition. 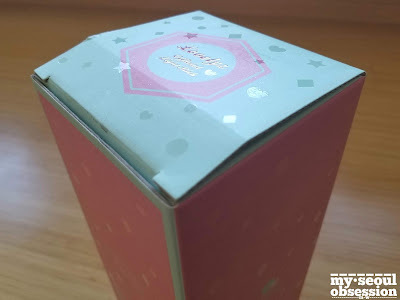 The box is matte with a clear overlay of mini hearts, diamonds, circles, and stars. 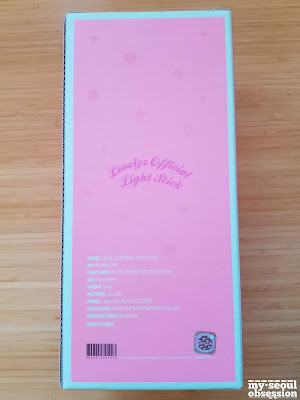 The words "Lovelyz Official Light Stick" are also made of the clear overlay on the front, back, and top of the box. The front also states the members' names, though I'm still trying to figure out in what order they're all listed. Both sides of the box have generally the same design. The back also lists the product information in English and has the holographic Woollim sticker. The lightstick is protected by a makeshift cardboard top. 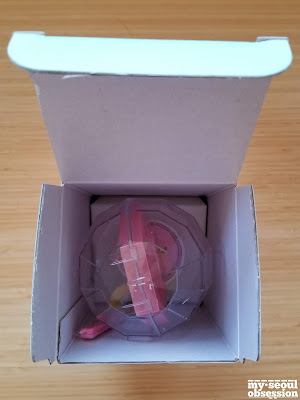 Removing the cardboard top reveals the lightstick, which is wedged in a cardboard platform. There is also a strap and a manual (placed underneath the platform). Here are the contents of the lightstick! The strap comes in a resealable plastic bag. 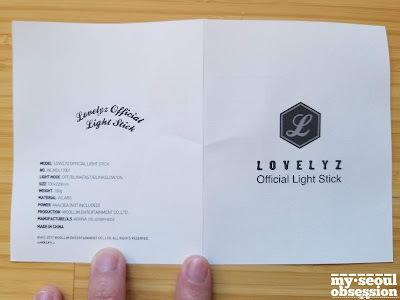 The strap is made of shoelace material, with "LOVELYZ" printed on both sides. 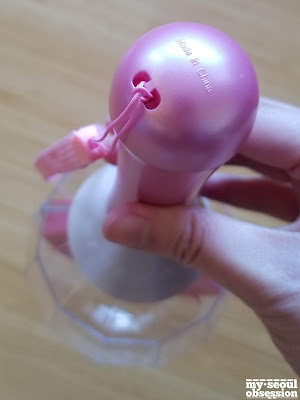 At the top is a string (like a cellphone charm) to be slipped into the end of the lightstick. The backside of the manual lists the same product information as the box. The inside of the manual details the instructions in Korean. The lightstick is run on 3 AAA batteries. The mechanism is pretty straightforward: unscrew the bottom of the stick to reveal a plastic container to house the batteries, then place the container back in the same orientation and screw back on the bottom and the batteries should be secured inside. The bottom also has a hole for you to easily slip on the wrist strap. 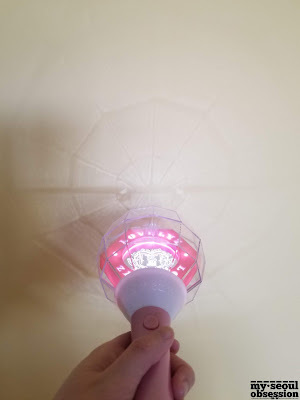 The exterior top half of the lightstick is made of transparent plastic with many sides and edges. 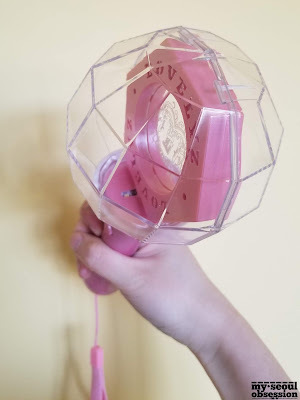 Inside the top half is a hexagon with "LOVELYZ" cut out on both sides that glows when turned on. 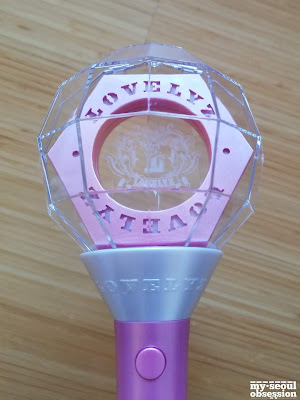 Inside of the hexagon is a transparent piece with the original Lovelyz logo printed on. The backside looks basically the same as the front, except that the center logo is backwards. 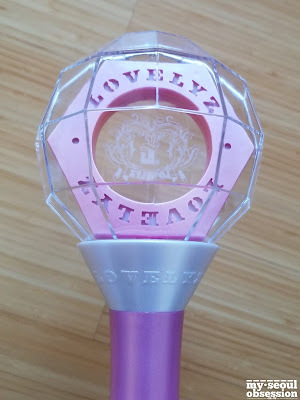 The base of the top half also has "LOVELYZ" embossed on both sides. Here is the lightstick! The handle is curved like a hyperbola, making it ergonomically correct. I hope you can use my hand as reference for the size. It's slightly taller than Infinite's lightstick and is about the same width. 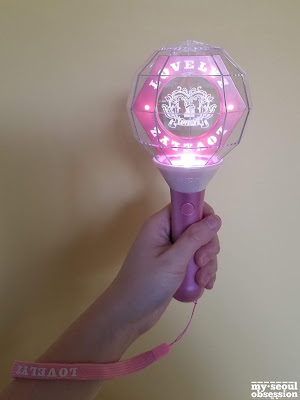 Here is how the lightstick looks when turned on. There are lights at the base of the top half, and lights inside the hexagon. At certain angles, the illuminated lightstick gives off pretty shadows. I made a quick video of the lightstick in action. 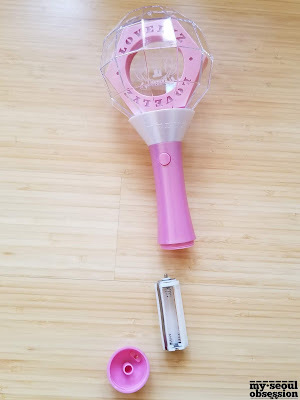 The lightstick has 3 modes: fast blinking, slow blinking, and on. 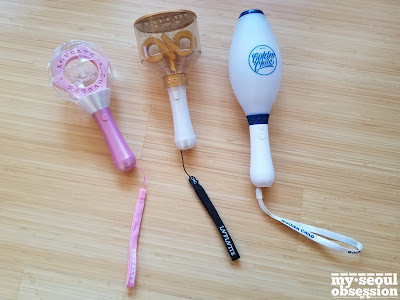 Infinite's yeobong and Lovelyz' lovebong are so similar, they really do feel like brother and sister lightsticks! 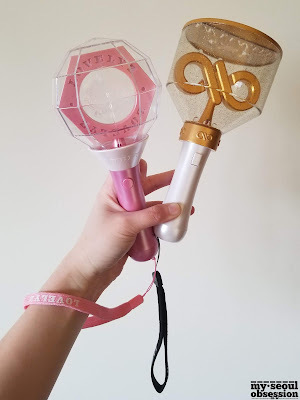 I love how the two designs are so elegant and I feel proud owning these and showing my support with these beautiful lightsticks. And I can't leave out a photo of the Woollim family lightsticks! 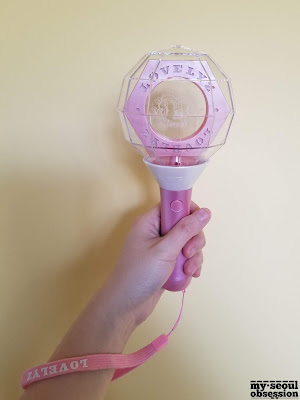 With all my unboxings I always say I'm so happy to have this in my collection, but I genuinely especially mean it with this lightstick! 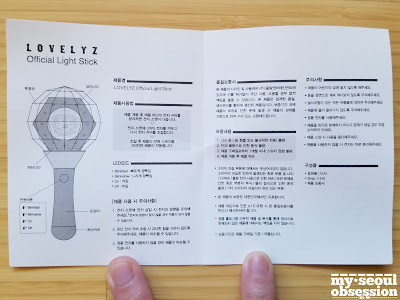 A lightstick is very special and connects the group with their fans, and I'm so happy I can be supporting Lovelyz at their first US performance. 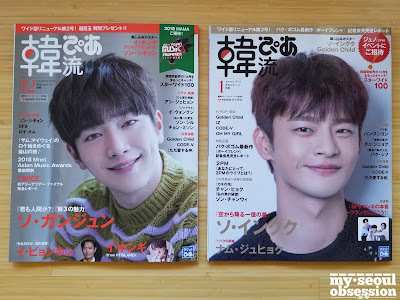 My Golden Child magazine collection has grown as I also purchased the December 2018, January 2019, February 2019, and March 2019 issues of Japanese magazine Hanryu Pia. 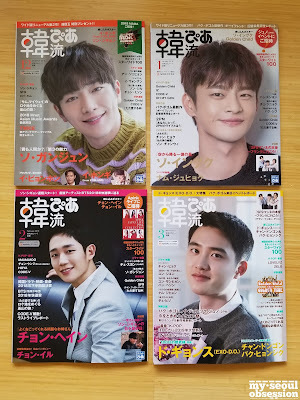 I got the December, January, and February issues from Seattle's Kinokuniya bookstore on January 26th, and the March issue on March 2nd, for just over $23 USD each (this is a slight markup from when I bought the October 2018 issue back in December). 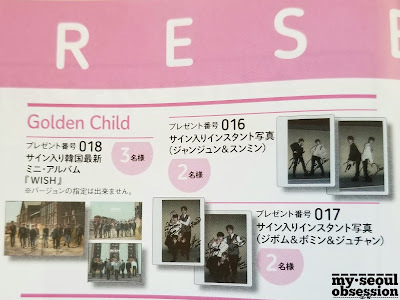 Golden Child has had their brief but totally worth it "Golden Time" segment in Hanryu Pia monthly since September 2018, however my foolish self wasn't proactive and didn't get the September or November issues. Here I'll blog about the December 2018 and January 2019 issues. In a future post I'll blog about the February and March issues. In these posts I'll also point out when other Woollim artists are present in these issues. 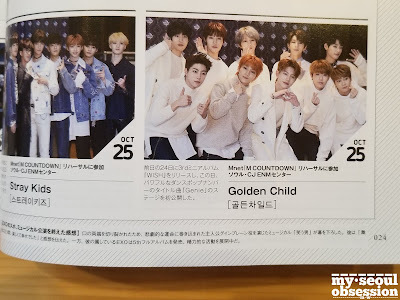 In the section showing celebrities' promotions, Golden Child makes an appearance! Here they are in their "Listen" outfits on M! Countdown. 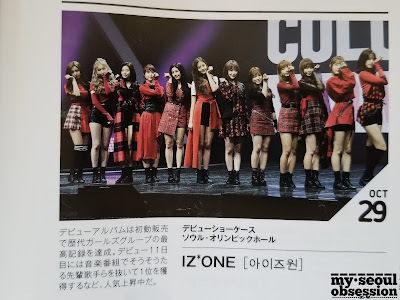 IZ*ONE also makes an appearance in this section. 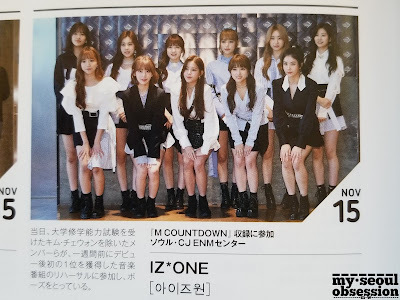 I won't mention IZ*ONE every time they appear because they're in this issue quite often...I'll only mention them if Woollim's Eunbi and Chaewon are clearly shown. Woohyun is also mentioned, unfortunately with no accompanying photo. Ex-Woollim actor Kim Min Seok is shown on a page dedicated to his drama "Age of Youth 2". One section also shows the TV broadcast schedule for various Japanese channels. Some time slots listed individual Infinite member schedules. 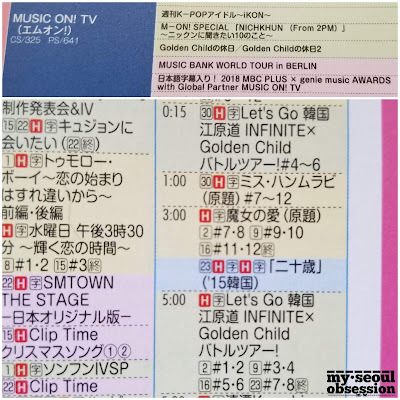 The two schedules that really caught my eye are a Golden Child feature and the Golden Child x Infinite Battle Tour. And now onto the main Golden Child feature, "Golden Time"! 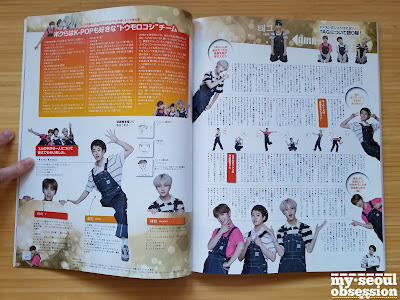 There are four pages to this month's "Golden Time", with the first two pages featuring Tag and Jibeom in overalls. 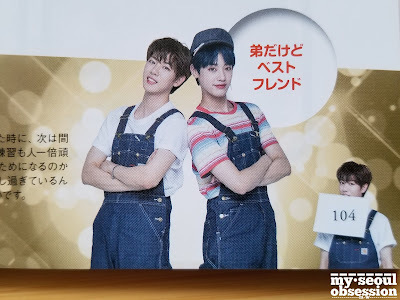 This is such a cute pose of Tag and Jibeom. And Jibeom with the piece of paper in his mouth is oddly such a cute image! 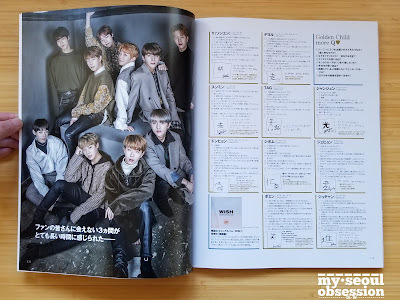 Even though I can't read Japanese, I do feel that these magazines are so worth it because there are so many pictures of Golden Child included in so few pages! 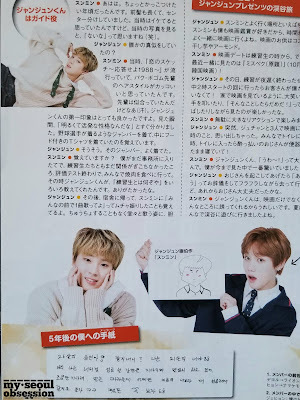 The second two pages contain Y, Seungmin, and Jaehyun, with Tag featured at the top. These three are so adorable like this! 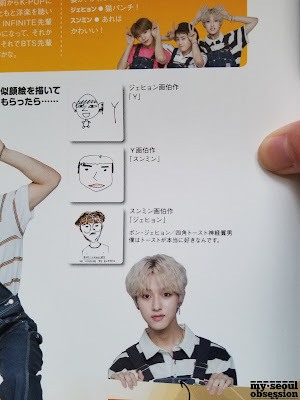 It looks like each member drew a portrait of another member. All the poses these thee make are too cute. 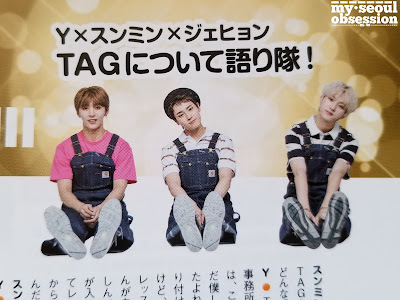 I really like how this magazine shows random groupings within Golden Child; it's interesting seeing these three together and they just look so cute like this! 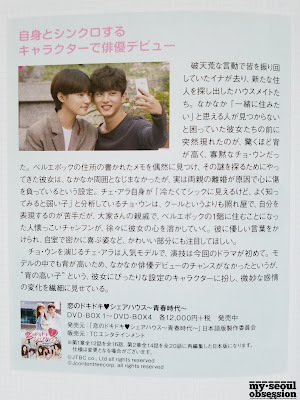 At the end of the issue are various Polaroid events of the featured celebrities. 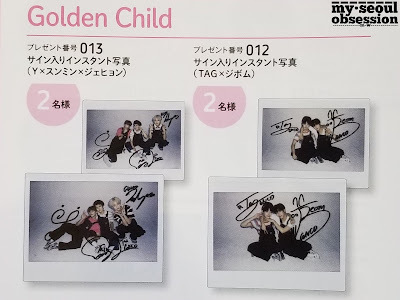 There are two Polaroids of Y, Seungmin, and Jaehyun together, and two of Tag and Jibeom together. 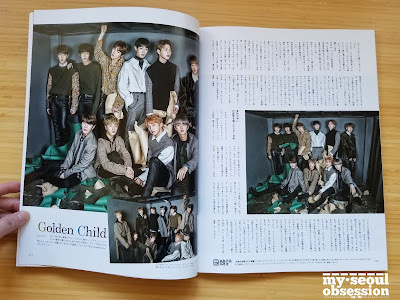 This issue is especially special because there is an additional section for Golden Child and it includes a folded poster of the group! This additional feature is also displayed in the table of contents with the same group photo as the folded poster. 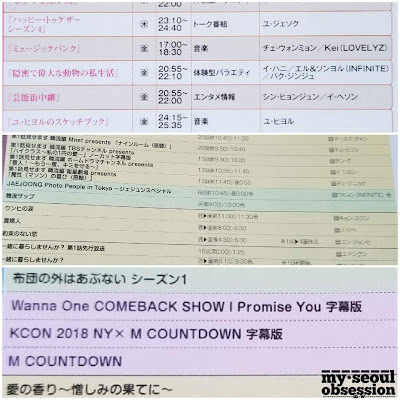 The section displaying celebrities' schedules shows IZ*ONE at M! Countdown without Chaewon. 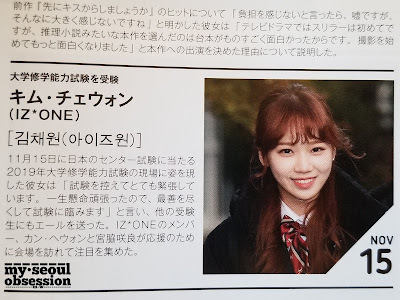 Another posting shows Chaewon in her Hanlim uniform on the same day, the day of the CSAT. 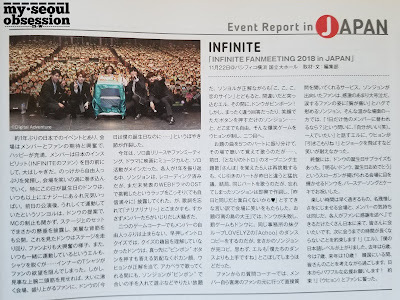 The section "Event Report in Japan" shows Infinite's fanmeeting as 5. 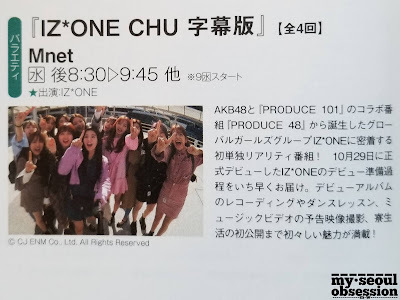 IZ*ONE's variety show is also listed. 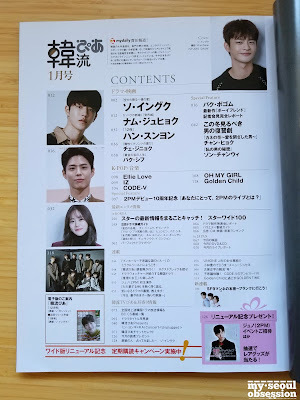 And on the TV broadcast schedules, shows featuring Kei, an Infinite member (I...don't know their names in Japanese...), Photo People in Tokyo with Woohyun, and the concert from KCON18NY (Golden Child!) are listed. And now on to Golden Time! There are four pages to this section. 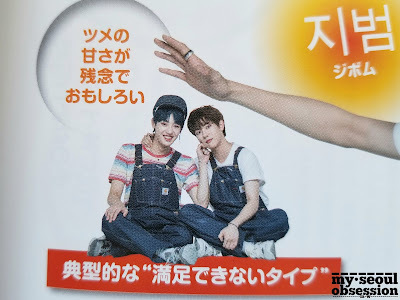 The first two pages feature the cutest Seungmin and Jangjun in such a soft boyfriend concept! 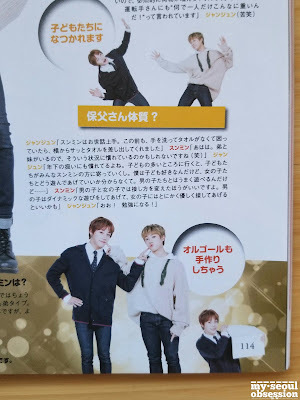 Jangjun and Seungmin are just really adorable together. 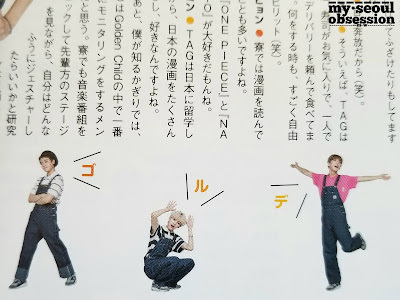 I love that they were paired to show off these cute poses! I think this is the cutest Seungmin I've ever seen. I really hope for an upcoming concept, they can style Seungmin like this! 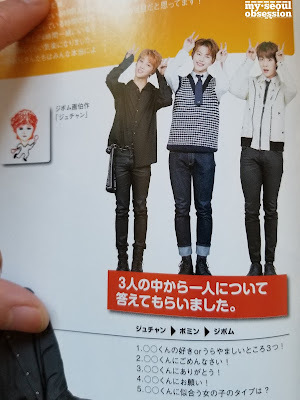 The second two pages show Jibeom, Joochan, and Bomin also in this really cute soft boyfriend concept! I can't get over this photoshoot. I really hope a future Golden Child comeback will have a soft boyfriend concept too! 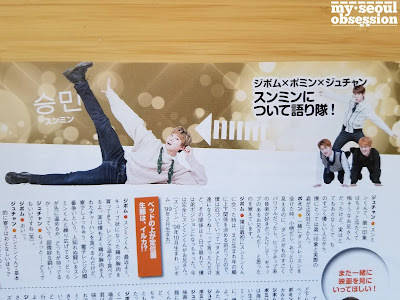 And directly after "Golden Time" is Golden Child's other interview special! 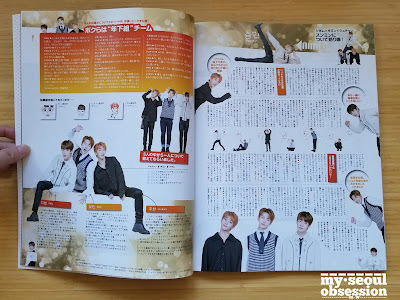 This feature has 8 pages and a special photoshoot of the boys in one of their "Genie" promotion outfits. 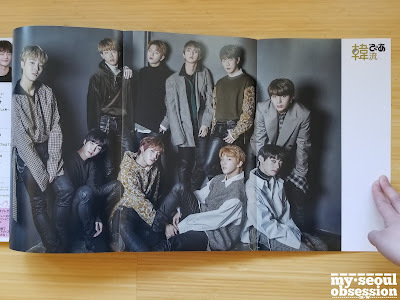 Golden Child is constantly promoting bright, energetic songs, so it's so different seeing them pose with such dark tones despite wearing promotion outfits. Included is also a beautiful two-page spread of Golden Child. And lastly is one more group photo, along with a mini section to interview each member, and their printed handwritten Kanji character, and a printed handwritten message. 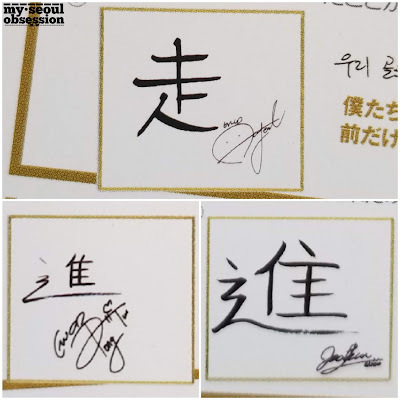 I'm so impressed by the boys' kanji writing skills. I guess it doesn't surprise me about Daeyeol since he likes to write with such nice penmanship (top), but Donghyun's (bottom left) and Joochan's (bottom right) definitely stood out to me as well. 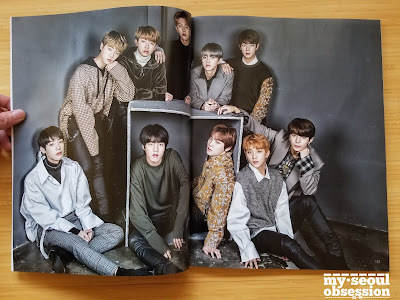 The last section shows the various gifts that readers can win, including Wish albums, Polaroids of Jangjun and Seungmin together, and Polaroids of Jibeom, Joochan, and Bomin together. 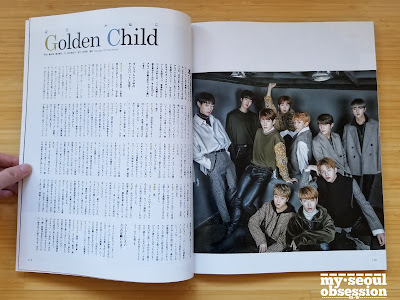 Please look forward to my upcoming post about Golden Child in Hanryu Pia's February and March issues! Annyeong! Here is a blog for my love and passion for the music, movies, dramas, celebrities, beauty, food and culture of Korea. .♥ Rini Cesillia's Beauty Blog - 린의 뷰티 블로그 ♥. DIGITAL SINGLE GALAXY SONG "REQUEST"
All images and content property of My Seoul Obsession. Please do not use without permission. Ethereal theme. Theme images by merrymoonmary. Powered by Blogger.